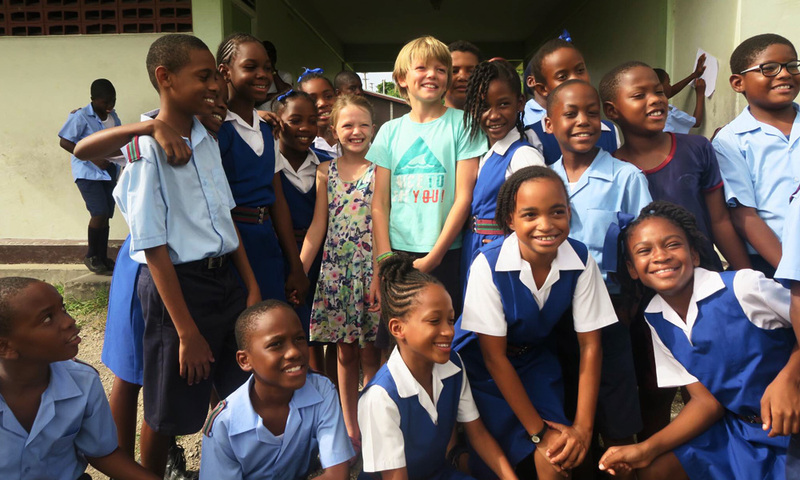 As the Barbados 50 sailing rally was a unique event to commemorate the 50th year of independence of Barbados by sailing from London to Barbados, it was only fitting that the families taking part should be able to share their ocean adventures with the children of Barbados. 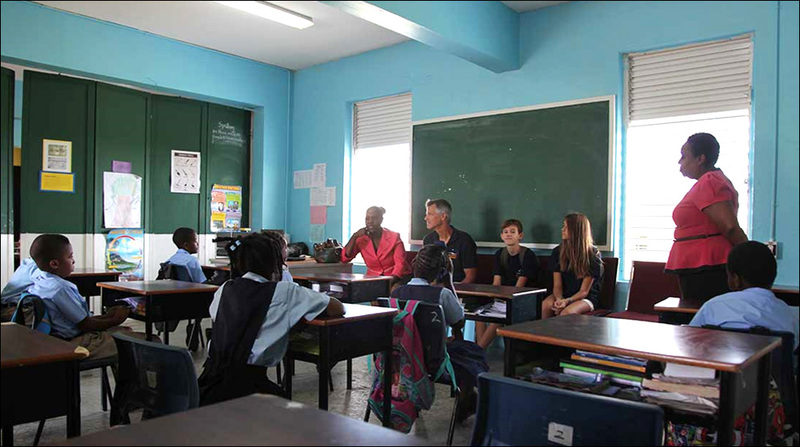 To this end the Barbados authorities worked with Cornell Sailing Events to partner local schools with individual yachts. Thanks to the wonders of modern technology, the children were able to communicate with each other via email while the boats were at sea. 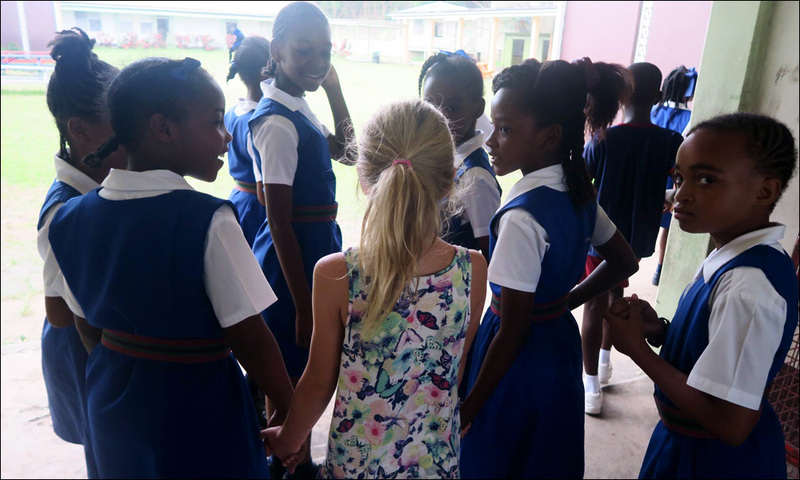 Rhonnelle Smith who has been working on the Barbados 50 schools programme, with the Siegel family from Laridae that Rhonnelle has partnered with a local school. 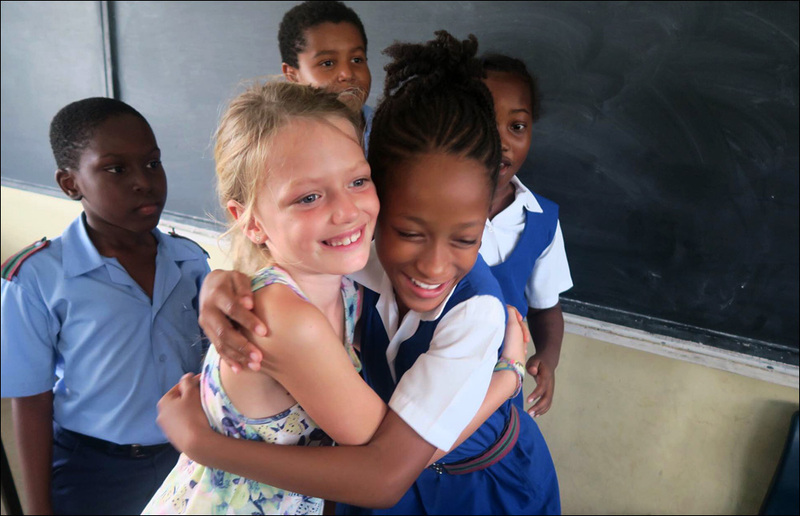 On arrival on the island, visits were arranged to the schools so they could finally meet each other. 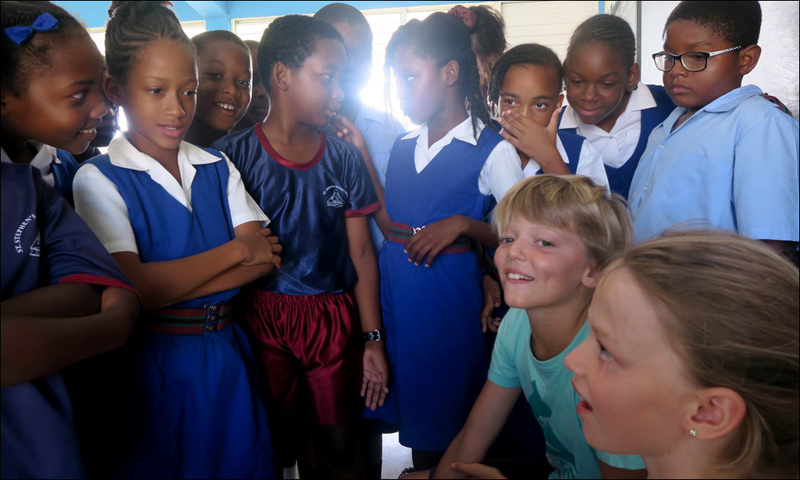 Here are a few extracts from some of the messages exchanged, as well as photos from Sta Vast and Sacre Bleu’s visits to their respective schools, St. Bartholomew Primary and St. Stephen’s Primary Schools. Simon & Elise from Sta Vast visit St. Stephen’s Primary School. We had a great afternoon at St Stephens. Thank you very much for arranging this meeting. This will be in our memory as one of the highlights of our sailing trip! It is an honour to participate in the Barbados 50 Odyssey Schools Programme and to be associated with the crew of the Sacre Bleu. 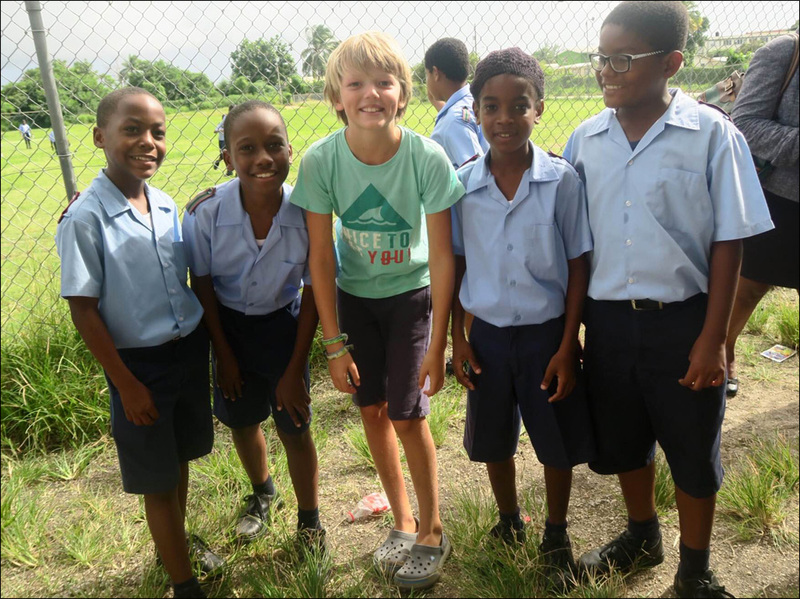 The experience of tracking the vessel as it journeys towards Barbados is novel for our students and one that has generated lots of enthusiasm. I am sure that Madeleine and John William will enjoy the opportunity to interact with our eight and nine-year-old students and their teacher, Mrs. Jordan, who have eagerly agreed to participate in this exercise. Our school is relatively small with a student body that is comprised of one hundred and forty (140) males and females between three (3) and eleven (11) years old. 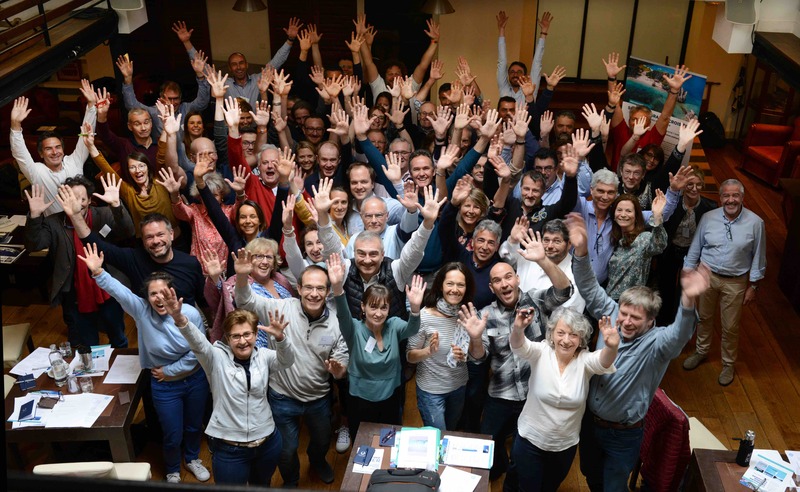 Seven (7) males and six (6) females are in the group that has been assigned to the Sacre Bleu. We look forward to hosting the entire family and also to the interaction that will ensue. This is Class 2 from the St. Bartholomew Primary School. We have been reading your messages with great interest and are fascinated with your sailing experiences. Our ages range from 8-9, with 7 boys and 5 girls in the class. We have varied hobbies such as playing football or netball, swimming, sewing and cooking to name a few. There are so many questions to ask you on this intriguing journey, but we will begin with these three. My name is Neilond and I am 9 years old. My name is Tazevann and I am 8 years old. My name is Marquan and I am 9 years old. These are just a few of the questions which we have and as time goes on, we will be asking more. Have a safe trip on the high seas and continue to have fun. Here are the answers to the questions the kids sent us yesterday. 1) Are you taking pictures of the fish you ve seen? We have taken many pictures of all kinds of sea life from birds to sea cucumbers. We especially have a lot of pictures of local reef fish and mollusks. Yes, we take pictures when we catch a fish and when we see whales or dolphins. We ve seen lots of dolphins. They seem to like swimming in front of the boat. And we’ve even seen a few whales. 2) How long do you plan to stay in Barbados? Most likely 3 days because we have to rush off to Martinique. That’s where we catch the plane to fly home for Christmas. But, we are planning to come back in 2 months. Three or four days. I’d like to stay longer, and we’ll probably come back in the winter. 3) After being on the sea for so long, do you think you’ll enjoy our beautiful beaches? Yes, I’m sure we’re going to love the Barbadian beaches. We’ve heard lots about them. I don’t like living on a boat. I can’t wait to get to stable ground, and that includes a beach. I’m looking forward to the beaches, and just being on land in general. 4) What games do you play on the boat? We have electronic tablets, where we can play lots of video games. But we do play board games such as Uno, Monopoly, Sequence, and Bananagrams. We play board games and video games, and when we’re at a beach, swimming, we play water games. 5) What type of food do you eat most days? My Mom is not a bad chef. She makes a lot of different foods. Italian, Indian, French, American, you name it she can cook it. She’s French, so French cuisine is her specialty. Most meals are good, but they have to be simple because the boat kitchen is so small. We eat a lot of pasta and rice, and grill things like sausage and hamburgers. 6) Have you ever seen a bull shark? No bull sharks. I hear they are one of the meanest sharks. But in the Caribbean I swam with nurse, lemon, and black tips. We’ve seen a lot of sharks, but not specifically bull sharks. My name is Aron Frederick, I am the Information Technology teacher at the St. Ambrose Primary School. 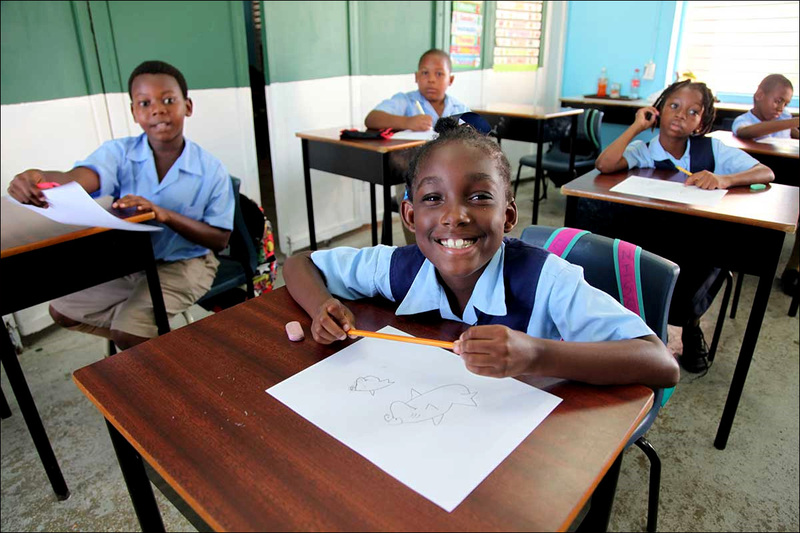 St. Ambrose Primary School is located in the heart of the capital city of Bridgetown. There are about 160 students in the school ranging from 4 years old to 11 years old. We are glad to be tracking your yacht as it crosses the Atlantic Ocean. The class that is going to be involved with the tracking is Class 4. Mr. Justin Browne is the class teacher. The students of this class are all between 10 to 11 years old. The students of the class, Mr. Browne and I are excited to have this opportunity to communicate with you on your journey. We have three students (our kids) on the boat. 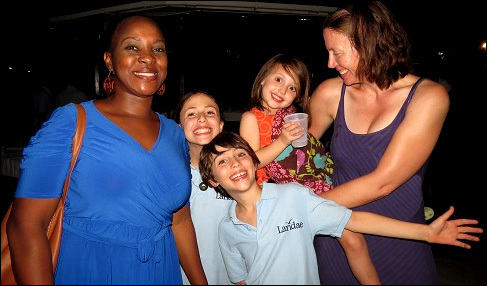 Their names are Eliana (age 4), Dorian (age 9) and Anneka (age 11). They are all doing school work, every day, while we are sailing. 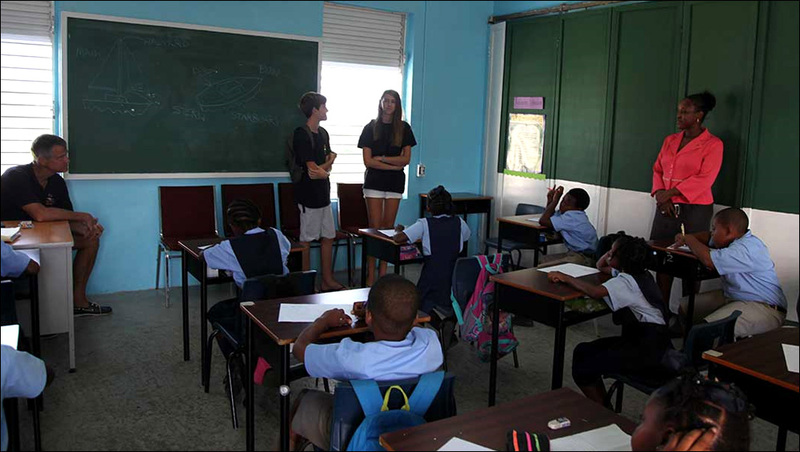 Their favourite subjects on the boat are Language Arts, Math, and the history topics that are related to the areas that we have been sailing. We are keeping a blog about our trip and we try to update each day of our voyage. You can read the blog here. We are also deploying oceanographic drifter buoys to study the ocean tides and currents. We deployed one buoy near Cape Verde. You can read more about that buoy and see its path here. We are also deploying 3 additional drifters on the passage between Cape Verde and Barbados. On these drifters, we are attaching messages in glass bottles. The messages will drift around the oceans until they wash up on a beach, and we can track their progress online! We deployed a drifter today and we put in a message from your school! We will show you how to track that specific buoy when we meet you in Barbados. The buoy was deployed at location 13.5N, 35.0W. Please tell us more about your school and your studies. We were happy to hear from you. The students of our school have been reading your daily blog and are intrigued by your journey. 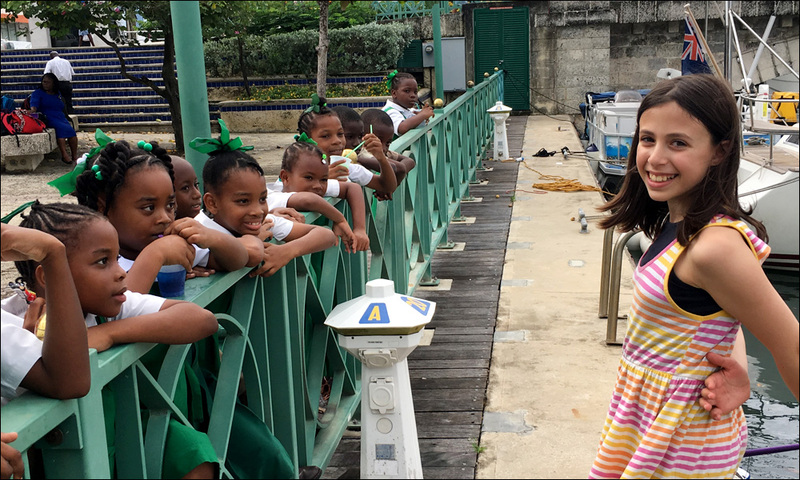 Our school St. Ambrose Primary is in the middle of the city Bridgetown. We share a yard with a church that bears the same name St. Ambrose. We wear plaid uniforms for the girls and light blue shirts and dark blue pants for the boys. There are 13 teachers at our school. Besides academics, we participate in games like football, netball and cricket. Our school day lasts from 8:40 to 3:00 pm. 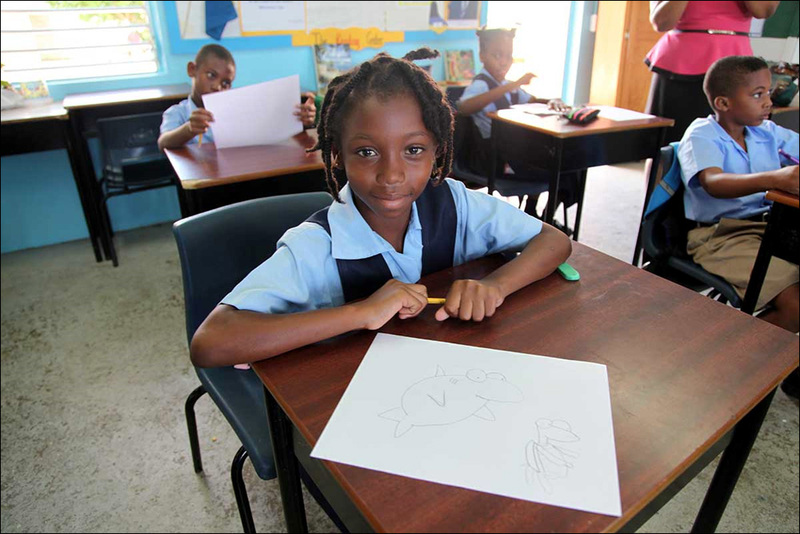 Our school is on the smaller side compared to many of the other primary schools in Barbados. We are going to be checking the links in the upcoming week to the oceanographic drifter buoys you sent during the upcoming week to see what observations we can make. The students have asked about your children and they are curious about where they play and what type of games they enjoy. 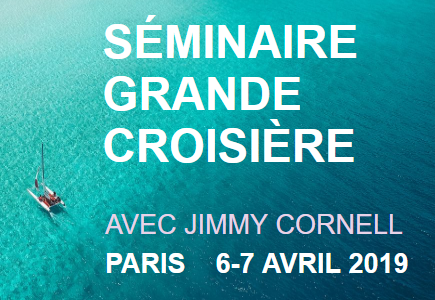 Someone has also asked about whether you have ever encountered difficulty while sailing and had to return to shore? What is the worst type of weather you have encountered? What types of instruments do you use? Mr. Frederick, our Information Technology teacher, has two children of his own and they are also being homeschooled like your children. They are 7 (boy) and 4(girl) who are also following your voyage with us as he told them about your trip. Next time we write we will include more about our class teacher Mr. Browne. We hope you continue to have a successful journey and we look forward to hearing from you soon and also meeting you. Hello to all students at St. Ambrose Primary! Thank you for writing back to us on Laridae. 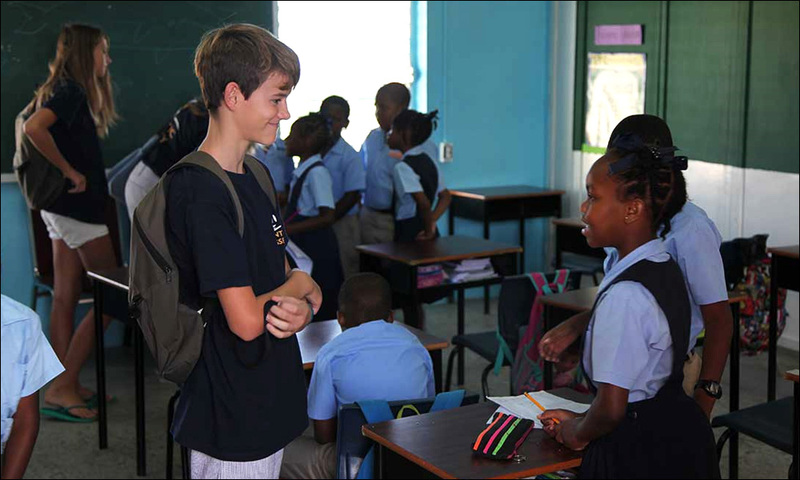 We are now about three days away from Barbados and we are very excited about arriving and hopefully meeting the students and faculty at your school! We have not seen any specific signs of approaching your island yet, but we will be looking out for different birds as we get closer in the next couple of days. What games do our kids play? Our kids love to play games, both on land and on the boat. On land, they enjoy playing cricket, running club, bicycling, swimming, roller-blading, and playing at any play-park. At the park, they like to play a game called “Forty Forty”. It is similar to Tag and Hide-and-Seek. We can teach you how to play. On the boat, they like to read, draw, and make crafts with paper, foam and tape. They also spend a lot of time doing their school work. They are working diligently to finish all of their school work for November while we are still sailing to Barbados so that they can spend the rest of the month exploring and enjoying your island! Have you ever had a problem that made you turn back to shore? Fortunately, we have not encountered any difficulty that would require us to return to shore. Because we are generally sailing downwind, returning (upwind) to shore would be very difficult. Once we set sail from Cape Verde, we needed to be self-sufficient and handle any problems on our own until we arrive in Barbados. However, most boats have some minor problems while on long passages. We had a clogged toilet that we needed to clean, and we had a brief problem with getting the gas (Butane) working on our stove. The gas problem was solved when we realized that a small switch had accidentally been turned off. Once it was turned on again, the gas and stove worked perfectly. However, can you imagine sailing for two weeks without a working stove? We do have enough spare parts to fix the stove and a back-up camping stove, just in case! So far, on this trip, the weather has been pretty settled and favourable for sailing. We had about 35 knot winds and 3-4 m waves for the first two days when departing Cape Verde. The wind was not too much for the boat, but the waves were steep and confused (coming from many different directions), so it was a little uncomfortable on the boat. These conditions would probably not damage the boat, but we had to be careful that the waves didn’t cause us to trip and fall when walking on the moving boat. We use a GPS to navigate the boat to Barbados. We use a Radar system to look for other boats and to identify rain and storms. We use an electric autopilot to steer the boat so we don’t have to stand behind the wheel for hundreds of hours. We use a VHF radio to communicate to boats close to us and an HF (SSB) radio to communicate with boats very far away. We look forward to hearing from you again and hopefully we can arrange a time to visit your school and show you photos and movies from our trip. We also want to hear about your favourite things about living in Barbados and taste your favourite foods! Best regards from the Crew of Laridae!